Sinister Cinema is a specialty film dealer which has sold several rare movies over the years which were filmed on ERB's Tarzana Ranch. 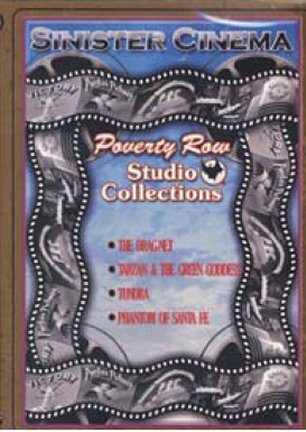 A DVD featuring four of these films is available, including Tarzan & the Green Goddess, The Dragnet, Tundra, and The Phantom of Santa Fe. For those without computer access, the phone number for Sinister Cinema is (541) 773-6860. We received phone calls from Burroughs fans who don't have computers, asking if there was a phone number they could call to order the Two Tarzan DVD sets from Warner Archives which we advertised in our last Gridley Wave. It is (866) 373-4389. These feature the Tarzan films of Lex Barker and Gordon Scott. In other news, British writer Eric Brown, author of 30 books and two-time winner of the British Science Fiction Award, has a new book on the market entitled Gilbert and Edgar on Mars which recounts the adventures of G. K. Chesterton on Mars and his meeting with Edgar Rice Burroughs. 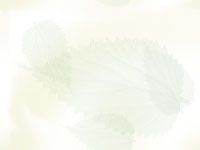 This is a limited edition from British specialty publisher PS Publishing (pspublishing.co.uk). 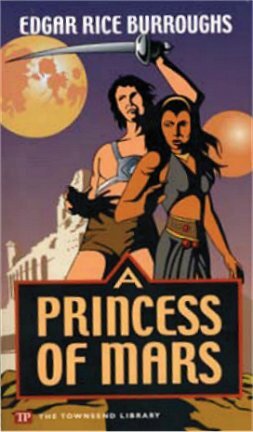 Of more than passing interest is a new straight-to-DVD film of Princess of Mars, produced and directed by Mark Atkins, and starring Antonio Sabato, Jr. as John Carter, and Traci Lords as Dejah Thoris. A cover blurb reads "The classic story that inspired John Cameron’s Avatar," the connection of which we don’t get. This DVD contains the feature film, a history of the making of the film, deleted scenes and trailers. 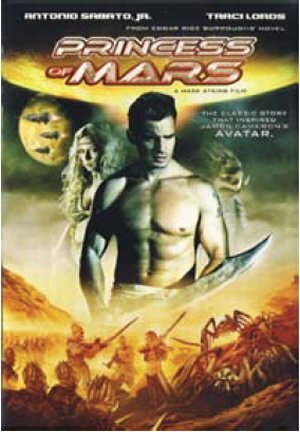 Sabato is a convincing John Carter, and "saks" over the Martian landscape with agility and verve. The film is available from Asylum Home Entertainment (www.theasylum.cc) or from any regular DVD store. Malcolm Henderson reports the death of one of our staunch Burroughs Bibliographers on Christmas Day. He was 83-year old Eddie Winders who had been a Burroughs fan from early childhood, and had helped many British fans to build their collections by lending them ERB books, or donating them or, as in the case of soldiers stationed at his home during WWII, giving them all of his Burroughs books for the war effort. He was also a member of the H. Rider Haggard Society. May he rest in peace. The Colorado State Magazine celebrated Glenn Morris as "The World’s Greatest Athlete" in its Winter 2009-2010 issue. Glenn graduated from Colorado State University in 1936 after starring in football, track, and basketball, and serving as president of the student body. 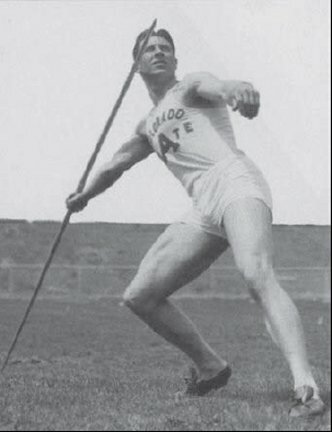 He soared to fame in 1936 by winning the Decathlon at the Olympic Games in Berlin, hosted by Adolf Hitler who was eager to show off the superiority of the German race. International Olympic historian Stephen Harris observed: "He only competed in three Decathlons, and he set an American record in his first, and world records in the next two. Nobody had ever done anything like that. He poked a finger in Hitler's eye by outshining all of his German athletes." Glenn returned to the USA to be featured in hero parades in New York City, Denver, and his home town of Simla, Colorado. Next, Hollywood beckoned, and he starred in Tarzan’s Revenge in 1938, opposite swimming star Eleanor Holm. After Hollywood, he enlisted in the U.S. Navy and served in the South Pacific where his war scars (both physical and mental) virtually ended his athletic career. He died of congestive heart failure in 1973, only 61 years of age. He was inducted into the Colorado Sports Hall of Fame in 1969, and the Colorado State University Hall of Fame in 1988. In 2007 he was inducted into the U. S. Track & Field Hall of Fame. 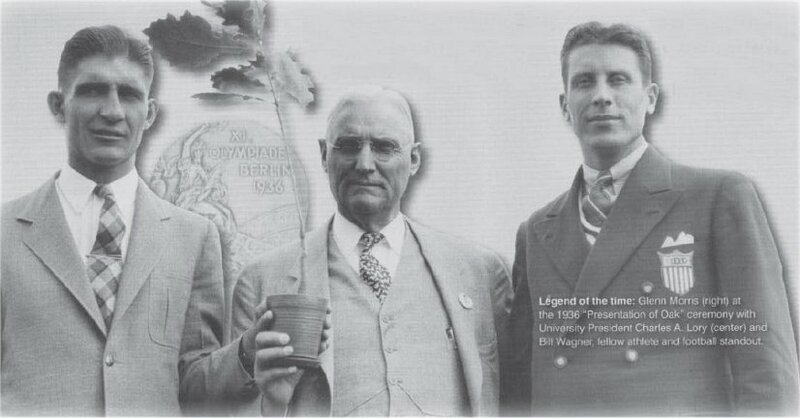 Shown here are photos of Glenn Morris as an Olympic champion, and with CSU President Charles A. Lory and fellow athlete Bill Wagner, at award ceremony in 1936. 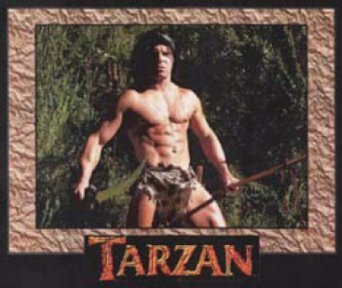 A young South-African body builder and actor named Dewet Du Toit has tapped into the internet several times in search of information regarding the new Tarzan movie being directed by Stephen Sommers. Du Toit says he doesn’t have an agent yet, but he is a confirmed movie buff and has written his own storyboards for a Tarzan movie. He has hopes of getting lucky, and included several photos of himself as Tarzan, along with a brief biographical sketch. He is 22 years old, and has a twin brother with similar aspirations. His email address is tarzan.ddt@gmail.com. © Copyright 2010, The Burroughs Bibliophiles. E-mail: george.mcwhorter@louisville.edu. Telephone: (502) 852-8729.